What’s love got to do with it? A worship series for the season of Easter. At Good Shepherd we have a mission that can be summed up like this: Worship, Learn, Love. It’s easy to understand how we are strengthened by Jesus in word and sacrament at a worship service and how we desire to learn more about his word in Bible studies, but what about love? What’s love got to do with it? What does love even mean today? This sermon series for the season of Easter comes from the epistle lessons in 1 John. 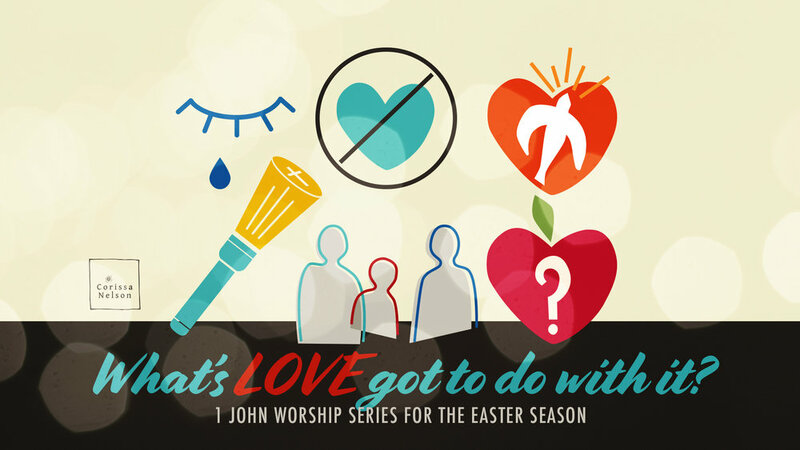 John will show us what love really is and how it impacts and helps us in our everyday lives. Easter 2 1 John 5:1-6 When I feel like a failure? Easter 3 1 John 1:1-2:2 When my relationships are complicated? Easter 4 1 John 3:1,2 When my family is messed up? Easter 5 1 John 3:18-24 When my conscience won’t shut up? Easter 6 1 John 4:1-11 When there are so many interpretations? Easter 7 1 John 4:13-21 When I’m scared? You can order the coordinating artwork for the "What's love got to do with it?" series in the shop.